When something goes wrong upgrading from one version of Windows 10 to a newer version, things can go really wrong. This has been brought home to me again and again by stories from sysadmins in the field who have been upgrading to newer versions of Windows 10 since the release of this operating system. One scenario that has been reported from multiple sources is the dreaded black screen during an upgrade issue. And I’m not talking about getting a black screen after your system reboots during the upgrade process. 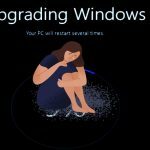 That problem is widely attested and well known, and if you quack-quack or Google or Bing the phrase “black screen after upgrade to Windows 10” you’ll get numerous instances of this happening and discussions of how to resolve the problem. No, I’m talking about a different kind of problem, one where the upgrade process proceeds as far as a login prompt appearing and then you log on and wait and just when you think your Windows desktop is going to appear, your screen goes black leaving only a white mouse pointer you can move around with your mouse. You may also see a command prompt window minimized at the bottom left corner of your monitor — or you may not. And if you see the minimized window and try to expand it by clicking on its title bar, it might open up to show a command prompt -- or it might not. And if you can restore the command prompt window to normal size, you’ll likely see the following text in the window’s title bar: “C:\Windows\system32\cmd.exe (Not Responding).” And when you click anywhere else on your screen with your mouse, nothing happens. Your only recourse at this point seems to be to press the power button on your computer to power the machine off and then on again. What happens next once again may or may not to be to your liking. On the one hand, when you log on again the Windows desktop may appear and you can get on with using your computer. But on the other hand you may get the same black screen again, with or without the minimized command prompt — and moving the mouse pointer around and clicking it doesn’t do anything. And if it happens to you repeatedly like this then you may be stuck with no option other than reinstalling Windows. I’ve heard sporadic reports from both ordinary users and administrators of this problem happening almost since day one when the first feature upgrade version of Windows 10 was released. Whether one upgraded from Windows 10 v.1511 or 1607 or 17-3 or 1709 or 1803, it seems that there’s someone somewhere who was experiencing this problem. I’ve heard reports of it happening with both PCs and Laptops from various vendors, and I’ve also heard about it happening with Microsoft Surface devices. And I’ve even heard it happening to someone on a handful of machines having similar hardware configuration to other systems that don’t experience this problem. What’s causing this behavior? And what’s the solution? What follows below are some observations and recommendations I’ve gleaned from various sources concerning IT pro colleagues who have had to deal with this kind of thing happening. But a definitive diagnosis of the root cause still remains elusive and I’m hoping that some of our TechGenix readers may offer suggestions that might help other users and admins facing this little nightmare. First, make sure that your Windows 10 computers are fully up to date with patches before you try to upgrade them. Some anecdotal evidence from two sysadmin colleagues I know suggests that not applying the latest patches could be the root cause of this problem sometimes happening. Next, make sure that all of the drivers on your computers are fully up to date. Because it could be that the newer version of Windows 10 you’re upgrading your machines to may no longer support certain older versions of your system’s drivers. Again, anecdotal reports indicate that keeping your display drivers updated may be the key to preventing this situation from happening in many cases. One colleague I know who experienced this found that some remote access software he had installed on his computers was breaking the upgrade process and causing the black screen with a mouse pointer to appear. The particular software program he was using in this instance for remote support of his computers was TeamViewer, but it’s possible that other types of remote access, management or support software might cause similar breakage problems during version upgrades. That’s actually a key point to remember when you’re upgrading systems of any kind, namely, the more extra software you have installed on the system, the more chances there might be of something going wrong during the upgrade. If worst comes to worst I suppose you could run a script to uninstall all you’re installed programs on your Windows 10 machines before you launch an upgrade, with scripted reinstallation happening afterward. With a systems management tool like System Center Configuration Manager (SCCM) this should be easy, but smaller businesses with Windows 10 Professional deployed may find it more difficult to implement this kind of workaround. Another colleague suspects (but could not prove) that drive-mirroring software on his Windows 10 machines was causing the above-described problem. Again, the more tweaks you’ve done with either the hardware or software of your computers, the more likely something weird may happen during an upgrade. I also heard a report that certain BENQ monitors might cause this sort of thing to happen when you use DisplayPort connectors and that using DVI-DL instead can bypass the problem from happening. And finally — though again this is certainly not the last word on this mysterious problem — one colleague told me that he “fixed” the problem by logging on and having the black screen appear, then waiting several minutes, then performing a cold reboot, then logging on again, waiting again, cold booting again, and so on multiple times until finally the Windows desktop appeared and stayed for good on his systems. I don’t know if I would have the patience to apply that kind of “fix” to a problem. How about you? Help our IT pro community by sharing your thoughts on the possible causes and fixes for the mysterious problem if you have any experience with it by using the commenting feature below.